Mango kesari recipe|mango sheera| Mango halwa is a delicious sweet|dessert made with mangoes. As mangoes are in season now i wanted to make mango kesari with fresh mango pulp. I wanted to make like South Indian kesari, but wanted to make it with the addition of milk. So i adapted my paal kesari and followed the same method by adding fresh mango pulp to this. The mango kesari tasted very nice. 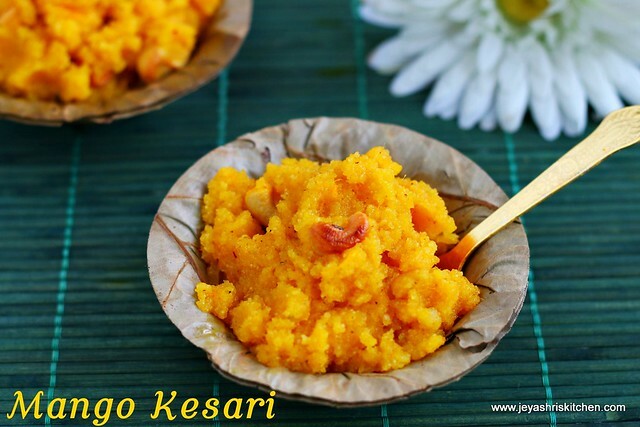 The vibrant colour of the mango kesari from the fresh alphonso mango pulp complimented the kesari. Check out my full collection of Mango recipes. In a pan add 1 tblsp of ghee and roast the cashew nuts. Keep it aside. In the same pan add 1 tblsp of ghee and add the sooji|rava to this. Roast till it turns slight golden colour. Be careful not to burn this. Boil the milk and add it to the roasted rava. Be careful as it may splutter. Better switch off the gas and add the milk. Do not worry if the mixture is watery, the rava will absorb the milk once it is completely cooked. Keep the flame low. Let the rava gets cooked completely. Also the milk also gets absorbed. Mix well. It will again loosen up. After few minutes it be ok.
Keep cooking it on a low flame. Add the milk masala to this. If not using milk masala add cardamom powder to this. Add 1 -2 tblsp of ghee to this. Add the mango pulp to this. I used fresh mango pulp for this mango sheera. Mix well. My mango pulp was slightly coarsely ground and so it could find mango bits in the kesari. Mix well evenly. Add 1 tblsp of ghee. Add the pinch of salt. For any sweets adding a pinch of salt brings out a best taste. Cook for 2 minutes in low flame. If needed add few more tsp of ghee to give a nice glaze. Instead of milk you can add water like how we do for kesari. Always use fresh mango pulp for best results. 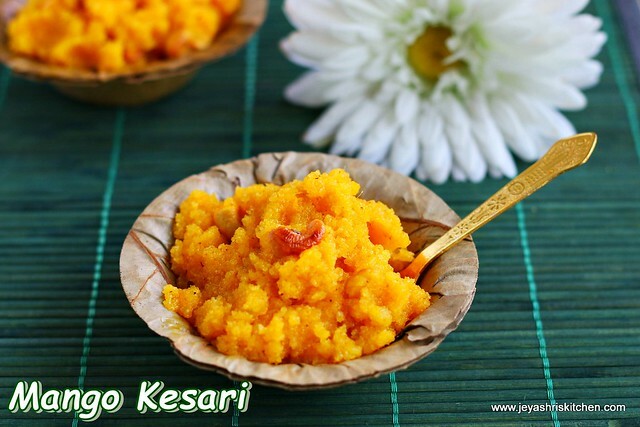 The kesari won't get curdled after adding the mango pulp, so do not worry. You can add fresh mango bits to the kesari while cooking the rava with milk. I used alphonso mangoes, you can use any variety of mango for this mango sheera | mango kesari.